Crossword puzzles are the world's most popular word game. The first crosswords appeared in England during the 19th century. They were a far cry from what appears today in US newspapers, derived from word squares, groups of words that can be read across or down. These early crosswords appeared in children's books and various periodicals. In the United States, however, the puzzle evolved to become a very serious adult pastime. During the height of the crossword craze in the 1920s, people lost their jobs and marriages were destroyed due to the addictive nature of these new puzzles. The first known crossword puzzle was created by Arthur Wynne for the eight-page comics section of the New York World. Usually, the page featured word squares, hidden words, and connect-the-dots exercises. However, Wynne wanted to try something different. He sketched a diamond-shaped grid (without black squares) and wrote the word "fun" (the name of the comics section) across the top of the square. In the English language, there are three different types of crossword puzzles: freeform or criss-cross crossword puzzles, standard, American-style crossword puzzles and cryptic crossword puzzles. The easiest of all crossword puzzles to create, freeform or criss-cross crosswords are word puzzles with loosely interlocking grids with a set of words going across and another going down, sharing letters where the two intersect. Squares in which a word begins have numbers which correspond to a clue made up of words or a picture which must be figured out to deduce the word. Freeform crosswords are asymmetrical and do not adhere to the guidelines set for standard and cryptic crossword puzzles. Crossword grids in most North American publications feature solid areas of white squares and are generally square, though there have been exceptions. Crossword grids in Britain and Australia generally have a lattice-like structure and up to half of the squares may be unchecked (example). The cryptic clues can be read as a sensible sentence, more or less, but actually consist of two parts. One part gives the definition, as in the standard crossword puzzle, the other uses some form of wordplay that hints at the answer. This wordplay may come in the form of anagrams, charades, container words, reversals, deletions, double definitions, or hidden words. You can find free crosswords all over the web, including right here on The Spruce. We offer a variety of different crossword games to play online or to print. Crossword puzzles can be found in print publications such as most newspapers and magazines. The online version of many of these publications also offers a free crossword, though most syndicate the Free Universal Daily Crossword from Uclick. Others, such as The New York Times, require a paid subscription. 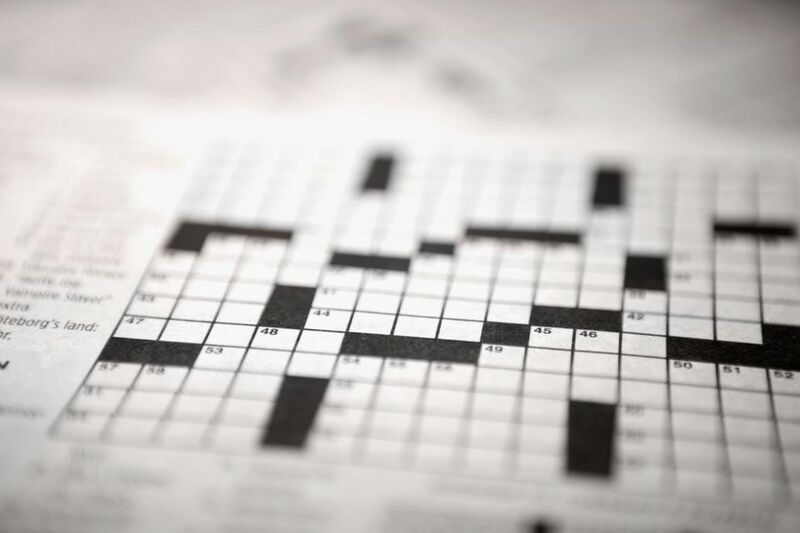 Go to Newspaper Crossword Puzzles for a list of U.S. online publications offering American-style crosswords or Crosswords Around the World for British, Australian and Canadian sites featuring both standard and cryptic crossword puzzles. If you prefer the convenience of a book, take a look at these crossword puzzle books that can be solved on the go or given as gifts. These books feature easy crosswords for beginners or ESL students, more challenging crossword puzzles for experienced solvers, U.K. or cryptic crosswords, crossword puzzles in large print for older solvers whose eyesight isn't what it used to be and fun and crazy crosswords for children.